2. Rigidity and simplicity: Grade-1 casted hardened and duly scrapped slide also the easy adjustment of machines as well as toolings enables an unskilled labourer to operate the machine. 3. 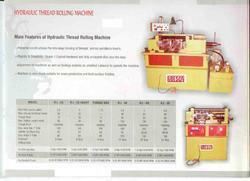 Machine is very much suitable for mass production and best surface finishes.